Pune Warriors 192-3 (Jesse Ryder 86, Sourav Ganguly 41, Morne Morkel 3-50) beat Delhi Daredevils 172-7 (Virender Sehwag 57, Kevin Pietersen 32, Alfonso Thomas 3-22) by 20 runs. Sourav Ganguly and Jesse Ryder humiliated the bowling of Delhi Daredevils which led Pune Warriors to a fantastic victory in the fifth edition of the IPL. Pune Warriors clobbered 192 runs for the loss of just three wickets when the last ball of the 20th over was bowled. Delhi Daredevils fell 21 runs short of their target with three wickets in hand. Sourav Ganguly (Pune Warriors) was declared ‘Player of the match’ for his all round performance in the game. He led the side from the front by smashing 41 runs off 35 balls, grasped two wickets at an important juncture and remained cool headed in the critical moments of the match. Earlier, Delhi Daredevils captain, Virender Sehwag won the toss and put Pune Warriors in to bat while preferring to chase accordingly. Jesse Ryder and Robin Uthappa initiated the innings in an aggressive mode as the latter sent the ball reeling out of the rope twice in the second over. Ryder showed the glimpse of his strength by getting 11 runs from the first three deliveries of the third over but Uthappa lost his wicket two balls later for 10 runs as the total reached at 26. The skipper, Sourav Ganguly came in next and joined in the race of scoring with the fast moving Ryder and the first fifty of the innings was completed in the sixth over with 3 fours. There was an outburst of the boundaries from both batsmen and the rival bowlers found it hard to stop the flow of runs. The hundred of the innings was accomplished in the 12th over and Ryder achieved his fifty on the first ball of the 13th over by claiming a single. The duo added 93 runs in 10.3 overs when Ganguly was caught at long on by Umesh Yadav off Morne Morkel for 41 off 35 balls with one six and 5 fours. The second wicket was gone at 119 runs as Steven Smith joined the show by punishing Shahbaz Nadeem for 22 runs in the 18th over which included 2 sixes and even fours. Jesse Ryder kept on cruising at the other end and the score was boosted to 186 in 19.4 overs when he was clean bowled by Morkel for 86 off mere 58 deliveries studded with 4 huge sixes and 7 fours. Steven Smith remained unbeaten for 34 from just 13 balls with 2 sixes and 4 fours as Pune Warriors posted a mammoth score of 192 runs when the allotted quota of 20 overs came to an end. Sehwag inducted seven bowlers in the attack but none of them left any impression on the batsmen except Morne Morkel who held three wickets. Delhi Daredevils lost their first wicket for just 12 runs when the centurion in the previous game, Kevin Pietersen joined with Virender Sehwag who opened up by scoring 11 runs off the fifth ball with one six and a four. 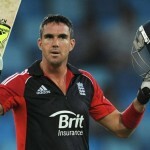 Pietersen blasted Angelo Matthews for 19 runs with three lofty sixes and the score was taken to 56 at the end of the seventh over. Sehwag butchered Jesse Ryder for 17 runs in the eighth over with two grand sixes and a four added by another 11 runs in the following over with one six and a four. The bowlers looked at the mercy of the batsmen when Ganguly took the ball for the first time in the current tournament to deliver the 10th over. He got the breakthrough immediately on the first ball of his over when the stumps of Kevin Pietersen were dislodged for 32 off 23 balls with 3 sixes and one four. The second wicket contributed 75 runs in 42 deliveries as Irfan Pathan tried to continue the momentum but lost his wicket for 15 runs. The bowlers of Pune Warriors took over from there and Sehwag was gone as the score touched 115 in 12.3 overs at his personal feat of 57 from 32 balls with 4 escalated sixes and 5 fours. Yogesh Nagar secured one end as the wickets kept on crumbling at the other end. He was the seventh batsman who went back to the pavilion for 24 off 19 balls with 3 fours as Delhi Daredevils managed 172 runs after losing seven wickets. Alfonso Thomas was the star performer with the ball by grabbing three wickets whereas Ganguly held two and Murali Kartik got one wicket. In the end, Pune Warriors won the match which looked slipping from their hands earlier, comfortably, by 20 runs. Delhi Daredevils – 8 from 6 games. Pune Warriors – 8 from 7 games.